Community Counseling Center was founded in 1968 by five local ministers who saw a need in the community for affordable counseling. It soon became a 501(c)(3) non-profit and has been a leader in mental health services ever since. It created Hotline in 1970 and operated Warmline (a parenting advice line) from 1978 to 1996. Over the years CCC (formerly Family Services Center) has participated in child abuse prevention education, AIDS counseling, inmate counseling at the county jail, literacy classes, and a variety of workshops and support groups. From an interview with Arlene Chandler, one of the early founders of CCC. Arlene Chandler (Bahr Vokoun), was born in rural Wisconsin to Eleanor and Rueben Bahr. 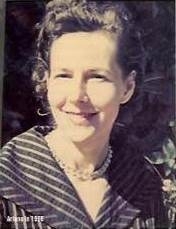 She lived in Wisconsin during her childhood and teen years and then in Chicago, Akron and Painesville, Ohio, Washington D.C., and Albuquerque, New Mexico before locating to San Luis Obispo in 1960. 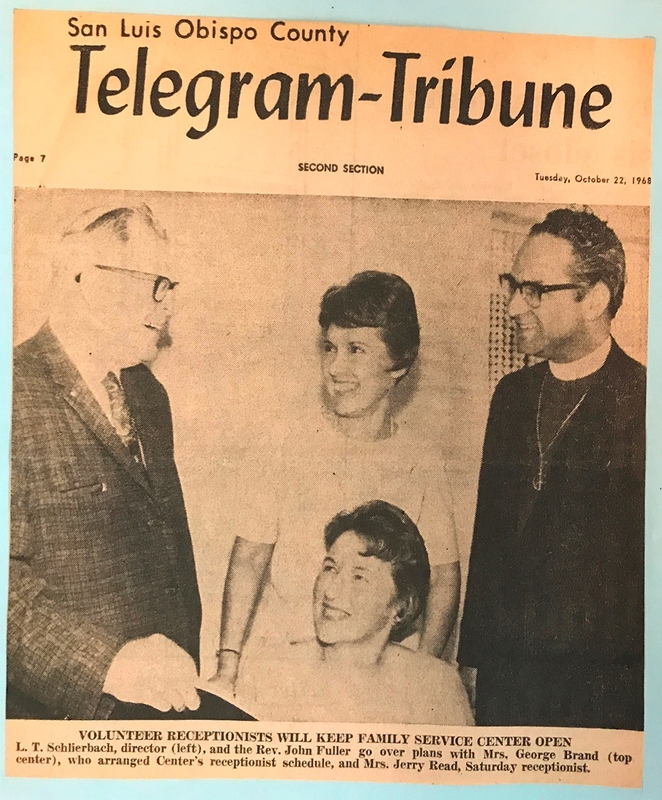 In the late 1960's, Arlene along with a few friends and volunteer professional counselors founded the "Family Services Center" to provide counseling and support services to those in need in our community, a service that did not exist at the time and which she supported to the present. Now known as the Community Counseling Center (CCC), the Center today helps thousands of persons each year. Arlene was honored in 2013 as a pioneer of the Community Counseling Center and annually, the "Arlene B. Chandler" award is presented at the agency’s Lyceum event to an individual demonstrating outstanding mental health leadership and advocacy. The idea for Community Counseling Center (formerly Family Services Center) came out of the Ministerial Alliance. It was principally the brainchild of L.T. Schlierbach, a retired chaplain from the men’s colony. One of his interests was that he saw the families of the prisoners and many of them had moved to this community and they needed help. Rev. John Fuller was the minister at St. Stephens and he was the one that really helped us get a little office. Dolores Brand was wife of George Brand, the newspaper editor, and she helped get publicity for the organization so those three people are ones that I recall were vital to the organization’s beginnings. Orville Hendricks, Wendell Wheeler, and Dave Richardson, a minister at a church out in Los Osos did a lot of excellent counseling. Douglas Hilton, recently retired as one of our judges, was an attorney and very valuable to us because we needed access to legal guidance that he supplied free of charge as a Board Member. Another minister was Rev. Paul Ray who was with the Baptist Church. He did lots of counseling and carried a heavy load. Nancy Jorgenson was a counselor at Cal Poly and was involved in the training of their therapists so she was very helpful in getting us trainees. Glen Dollahon, was the assistant principal at the high school, so we had a connection with the schools also through him. The ministers of the city were really being over-burdened with counseling requests, not only from their own members, but from people from the community who had no other place to go. Apparently they had discussed the problem at a meeting and decided to form an organization which would consist not only of the ministers, but of lay people of the community who were interested and capable of providing some counseling services. I read about this effort in the newspaper, the Telegram Tribune. And as I was teaching Marriage and Family classes at Cuesta College, I too was recognizing the great need for counseling services in the community. Even though I wasn’t teaching there as a counselor, but as a teacher, I would find long rows of students sitting outside my door in the hall waiting for a chance to come in and talk to me about personal problems, so I was very aware of the lack of counseling services in the community. The incorporation as a nonprofit was largely the work of L.T. Schlierbach and Mimi Butler, who is still a resident of this community. She and her husband, Morris ran an accounting firm and she served as Treasurer of the organization at that time. She had heard about the organization of this entity through the Methodist Church, where she was quite active, and where the youth minister was on the board of this early organization. Her accounting firm had done a great deal to get that incorporation finalized, and continued to serve the organization for many years with with financial donations and their accounting services, which were donated free of charge. The Butlers were a very important part of the early formation of the organization. There were no professional counselors for a long time, other than volunteers and the ministers, and the ministers did a great deal of the counseling. The volunteers at that time had very little training, however the ministers were counselors to some extent because that was a small part of their theological training. The other people who worked as counselors were generally school counselors, or people like myself. I was a trained counselor and I recruited other trained counselors from Cuesta College and the Cal Poly Counseling Division helped also in supplying and then providing us with counseling trainees as time went on. But in those early days, 1968 or 1969, I think, the State of California was establishing some professional requirements as there were very few licensed counselors. I was one of the first in the state. The organization was very interested in moving as rapidly as possible from lay and pastoral counseling to professional licensed counseling. A person who was a great help in that was June Gersten. I recruited June to help with what was then Family Services Center, on or about 1972. I knew that she was then available in the community as she was setting up a private counseling practice. I talked to her about doing some volunteer work for Family Services Center and she became a real centerpiece in the organization. She had graduated from Sacramento State with counseling training, and had been a counselor at Cal Poly, especially for international students. Professionally trained Counselors from Cal Poly, and Cuesta College helped for many years. Two counselors from Cuesta College, Owen Eister and Orville Hendricks, were especially helpful. Orville’s wife, Judy Hendricks, was president of this organization for at least two years. Orville later went on to become nationally known for couples workshops. Looking back over the early years, some of the other people who were very important in the organization included Gladys Loomis and the Reverend George Aki. 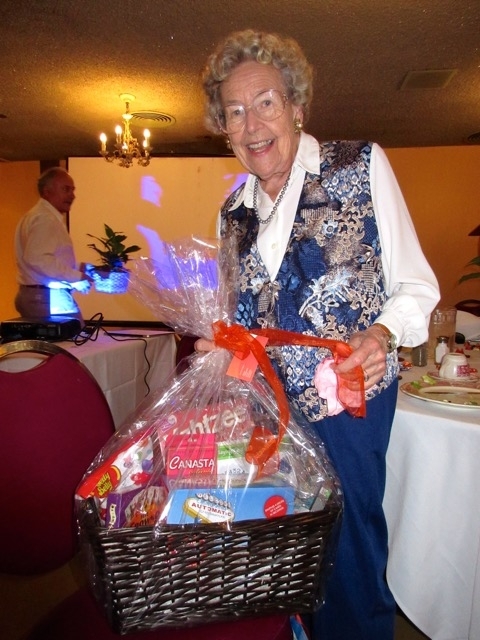 Gladys was one of our most dependable fundraisers. We had big BBQ’s annually at the Tar Springs Ranch, which is owned by the Loomis family, and the income from the BBQ was probably one of our main financial resources for a long time. Reverend Aki was probably one of the most active counselors and would regularly see clients in his office at the Congregational Church. Rev. Aki was especially skilled at working with alcoholics, and quickly became known in SLO County as the person to call when alcoholism was a problem. Also, due to a scarcity of available services, Rev. Aki and his wife would sometimes house endangered, battered women in their house overnight. This was done under the auspices of his Ministerial position and not as a counselor for Family Services Center, though at the time FSC was doing limited work with alcoholics and battered women. During those early years, while I was President, I initiated the first funding with United Way. There were no grants at that time, just an annual letter. Otherwise, there was no tangible linkage between FSC and United Way, and strangely, the Board hadn’t thought about going to them because with the Ministerial Alliance being the starting group, they kept turning back to the churches for donations. They hadn’t really considered becoming big enough to ask for help from United Way. I did that. I don’t remember when we started writing grants. I remember them when we had the work study student. I had her doing some grants for practice as a part of her training, but I don’t remember them being sent out for funding. We were paying rent on Mill St. when the big flood came, and the Carpenter’s Union took us in for a very small token rent in a very small office upstairs in a building on Palm Street. There’s a humorous story relating how we got that office. Our first “real” office was provided by the Episcopal Church and was in that little house at St. Stephen’s. That served both as an office where our phone was and as a place where the counseling could take place. When St. Stephen’s grew larger and needed their space back, we moved to a small building on Mill St. that we shared with a small carpeting business. June Gersten was more or less holding the organization together, running the office and doing counseling as well. In early 1969, San Luis Obispo experienced a major flood. Somehow June and I realized the vulnerability of our office’s location and went to check on it. We rolled up our slacks and waded into nearly a foot and a half of water to retrieve our typewriters, phones and client records. We loaded them into the trunks of our cars, so for awhile, Family Service Center’s offices were truly mobile, located in June Gersten’s and Arlene Chandler’s cars! That’s when the Carpenter’s Union, realizing we’d had an emergency eviction, came to our rescue and took us into their building. The only counselors in the beginning were the retired ministers and chaplains and school counselors. Gradually, FSC moved away from ministers and lay people and started recruiting professional people to do therapy. Counseling was a profession that was developing rapidly during that period of time. As counselors became available, the ministers were delighted to be able to relinquish some of the load that had been on them. It was a happy, mutual separation of task probably never formally recognized as we were making the change. Some of the ministers remained involved for quiet a while. Others were very happy to relinquish the responsibility as soon as they could, because they were very over-burdened with their tasks and their churches and then we would call and say we have this desperate woman and she needs help, someone to talk to, etc. adding extra responsibility to their workload. There were a lot of war veterans, Vietnam vets and a lot of marital problems. We were doing pre-marriage counseling with engaged couples and also with unwed mothers. That was a big concern in the beginning. There was really no place in the community for unwed teenage pregnant women. Society has changed their attitude a lot about that but in the beginning that was an extreme problem. County Mental Health was operating but over-taxed and understaffed, as it always seems to be. We always felt encouragement from them and I don’t recall that they ever felt we were moving into their territory. As I recall, there was always a feeling of cooperation, not animosity. Both colleges, Cuesta and Cal Poly, developed more personal counseling and not just academic counseling which really helped lessen the load for FSC. But, there was always a great need. From an interview with Lucinda Borchard, former Board member & Executive Director of CCC. Lucinda “Cindi” Borchard was the Executive Director of CCC from 1988-2000. She saw the agency through a growth period that focused on recruiting licensed volunteer therapists and helping make services available across San Luis Obispo County. 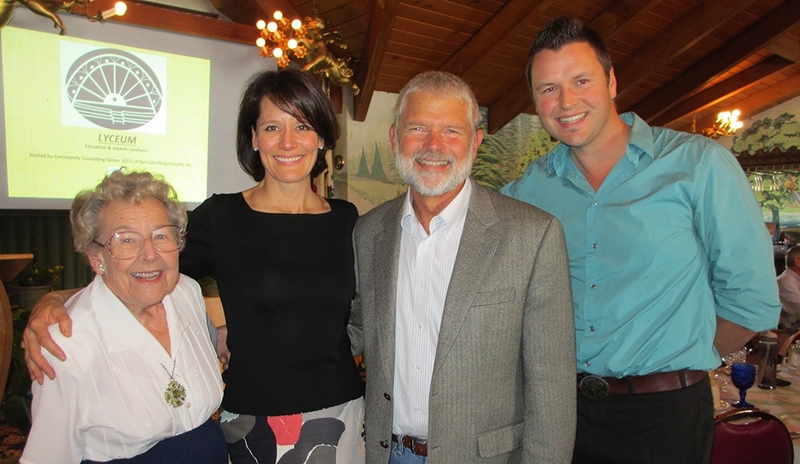 Her leadership later transitioned to the Board of Directors where she became the primary organizer of the signature fundraising event “Hearts & Minds” held at the Tolosa Winery. Cindi continues to be a champion of mental health service causes and a CCC treasure. “When I came to FSC, the agency was located in the old French Hospital building. There were two rooms. The previous Executive Director had left to become a novelist and moved to Japan. The Board of Directors had maybe two community members and the rest were therapists. 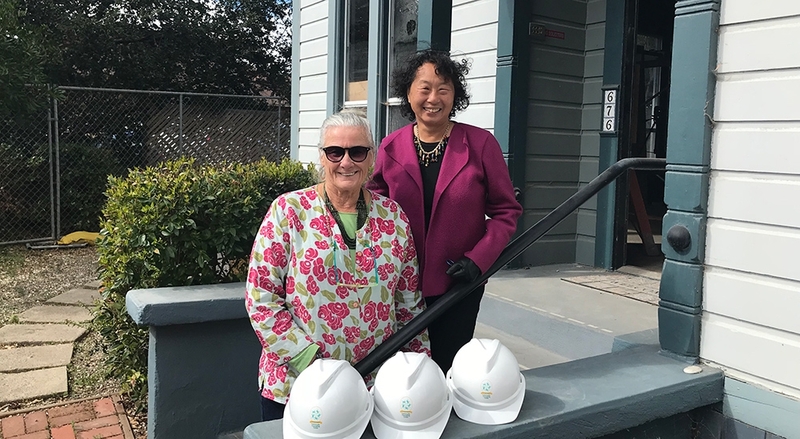 The weekend that I started, we moved from French Hospital to 504 Higuera St. where our next door neighbors were the Mental Health Association. We were there for a long time. At that time, my office was used for counseling, so there were actually three counseling rooms and then we set up the outside as a garden place. And then, of course, we had all the therapists that used it for their private practice because at that time we had only two people in Paso Robles and Los Osos. There were no longer any ministers doing counseling. They were all therapists and mostly licensed. The only schools that we dealt with then for pre-licensed therapists were Antioch and Pacifica. The pre-licensed people all had their Masters’ degrees so they were interns. We did not have any trainees. When we hit 1,000 clients in a year, that was a big deal. I think we had 1100 clients that year and at one point we had 63 active therapists on staff. That was huge. Sometimes clients had four month waits to start therapy. That is when we made the policy that people had to wait six months before they could come back for more counseling. And we had the same exact ebb and flow of client numbers during the year that CCC now has. Our therapists were such an interesting group of people who really just wanted to give back to the community and believed in mental health services. There was this whole group of therapists that came out of the 70’s and 80’s encounter groups. Groups were really, really popular then. So we had some groups and also the client numbers were so high from the Warmline parenting hotline. And we did so much information and referral then. We had a motto that this would be the last phone call anyone would make. We were going to give them the information they needed, find the exact one that they needed. Warmline was still operating when I was at FSC. Sumiko Kusomoto was someone I could call because her husband was a pediatrician and she worked in his office. I could call her and she would get right on it. And there were others taking those parenting phone calls. I think it was really a very good service at the time. The calls were things like, “I’m losing control and I’m going to hit my kid.” It was serious stuff. We worked with the AIDS Support Network to counsel AIDS clients. And we worked with a lot of the families of HIV positive people too. In those years, AIDS was pretty new and people didn’t live as long as they do now with HIV. We did many groundbreaking things. There was a terrible, terrible accident with a fishing boat. A man got decapitated. Another found the man’s head in the nets. The Coast Guard went out to take care of it and the Coast Guard guys were so upset and there was nobody for them to talk to. They called us and we put together a trauma team in a matter of two hours that went out and talked to all of the people that were on the fishing vessel but also to the Coast Guard. We really “rolled with the punches” depending on what the need was at that time and then we would step in. We rebuilt the Board of Directors to include many more members of the business community because that was a really important thing. There were just two employees then, myself and Kim who was only there for a year and then Sally Thompson was with us for many, many years, and she did all the books and all the check writing. She and I did all the client intakes and it was part time, only 25 hours a week. So we were hopping all the time. Sally also did all our taxes. We have a history of workshops in the community, not necessarily for therapists. We had a whole series of workshops in the community for the public in locations all over the county. They were different subjects. For instance, one night was about parenting. One that I remember vividly was on organizing, how cleaning out your mental cobwebs can lead to de-cluttering your house. In recent years, we again have been offering continuing education workshops for county therapists. It is a good way to get the word out about what we do and gather people in. I think one of the biggest challenges we had at that time was getting enough funding from the county Board of Supervisors. I was in a group with other agency people who jointly asked for money every year. And we all got just a very small amount of money. Finally, I decided that since FSC was doing the work that the county should be doing, we should be getting more county money. So I struck out on my own, asking for annual money and we were able to get four times what we were getting before. The Board of Supervisors became more aware of mental health issues. There was an 18 year-old kid who had been turned away from Mental Health. He had been told, literally, to go home. He had an on-going case at Mental Health and he was told to go home and “get a grip on it.” He went home and killed both of his parents. Both of his parents were very, very well known people in the community. One of them worked for the County. So I used that story all the time to explain why we needed more mental health services in the county and why FSC was needed. I used this example to educate groups about the connection between mind and body. Our biggest challenge was always money. Sometimes our work with clients is not immediately obvious. Treating one client here can have an effect on up to one hundred people in their circles of work, community and family. Our biggest accomplishment is that one year we were nationally recognized for being the only agency in North America (in that national group’s membership) whose full clinical staff was volunteers. No one else does this. Our biggest accomplishment is that we are able to fully utilize the very generous services of the mental health community and that we do it with very little overhead cost. The Women’s Shelter was just getting started so we always sent people there. We had clients mostly dealing with relationships, parenting, depression and we took a lot of people that I didn’t think were appropriate, but they just didn’t have any place to go. Substance abuse was always a major issue. They may not have been coming to FSC to get clean and sober but we didn’t have requirements then that they be sober or clean for a certain amount of time as we do now. The substance abuse just had to not be their major issue. There was only one substance abuse program through the county. There was a time when there was a detox place in the basement of French Hospital, a residential detox. There was also a psych. unit at French that is now closed. Client fees were always $15 minimum. That doesn’t mean that was what people actually paid. That is what we asked for. A lot of people, as now, paid much less because they couldn’t afford to pay $15. But we always charged something for our services. That is a client responsibility. I don’t think people put a value on things they get for free. We were getting funding from many of the different cities, it might be just $300 and we had to spend four hours in front of the City Council in order to get that. United Way money was huge then. And we had various grants. About five years ago, CCC went through some very tough times with not enough financing and personnel issues. The Board made a decision and financed, out of their own pockets, enough money to hire a full-time Executive Director. The time had come to either close the agency doors or run it the way it needed to be run at that juncture. Pat Harris, one of the Board members, wrote a capacity building grant to the California Endowment that was funded. We received a large grant for two years. That grant and the hard work and financial support of Board members, volunteers, and staff, stabilized CCC again. Editor's note: CCC saw over 1,000 clients last year. 696 were given intake appointments and offered weekly counseling and 377 were given information and referrals. The agency had 63 different therapists volunteer their time during the year. All of our therapists are still volunteers.